For those who don’t know what “kapari” is, they are baby caper stems pickled in red wine vinegar. They are different to pickled caper buds, which is what most people know. The pickled caper bud is, surprise, the pickled bud of the caper plant. In my opinion “kapari” is not very similar to pickled caper buds. I don’t know what you think. I find “kapari” fleshier in texture because it consists of a caper stem and leaves, and it also isn’t as tart as pickled caper buds. Pickled caper buds go well in sauces and the like, but I am not really sure if “kapari” would go well in a puttanesca sauce. 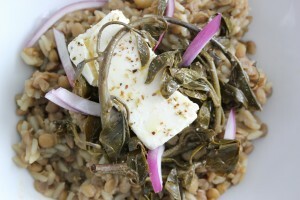 It is difficult to find “kapari” outside of Cyprus and Greece. 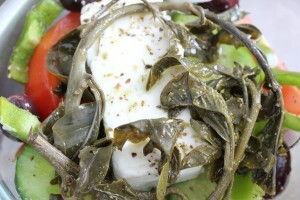 In Cyprus, “kapari” is often served together with salad, meat or fish. Basically it goes as a side pickle with many foods. Sometimes, I can even put some “kapari” in a bowl and eat it just like that. But I am not sure if that is normal. I’ve also heard of someone putting “kapari” in a dry martini as a substitute for an olive. New drink anyone? OK, so the health benefits. Apparently in Greek popular medicine, a herbal tea made of caper root and young stems is considered beneficial against rheumatism. Also, in ancient Greece, apparently the caper was used as a carminative, i.e. something that helps prevent the formation of gas prevents formation of gas in the gastrointestinal tract. I am not sure what effect the pickling process has on these benefits though. But, if you are like me, it pleases me to know that the plant has health benefits. Caper plants (capparis spinosa) are said to be native to the Mediterranean basin, but their range stretches from the Atlantic coasts of the Canary Islands and Morocco towards the eat to the Caspian Sea and into Iran. 1. Go to a mountainous area and pick baby caper stems. A lot easier said than done. 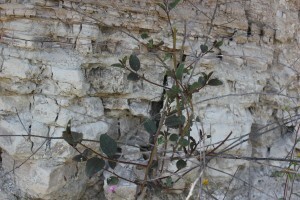 Caper plants like to grow in rocky places. Sometimes steep, rocky places. They can grow in cracks and crevices of rocks, and in stone walls. Basically these plants are fighters – rather then die, they seem to thrive in nutrient poor, sharply drained and gravelly soils. The first time I went to pick caper stems my aunt took a stick with a hook on it and wore runners and pants – in the Cyprus May heat. Weird I thought. I wore ballet flats, took a camera and a plastic bag. My aunt gathered three bags full of caper stems. I gathered a measly half a bag, was attacked by insects and had to be rescued from a cliffside. Moral of the story: Wear runners. Wear pants. And take a guide the first time you go. Unless you know what you are looking for, caper plants can be hard to spot. They can grow on the sides of roads, in rocks and in between an assortment of other plants. 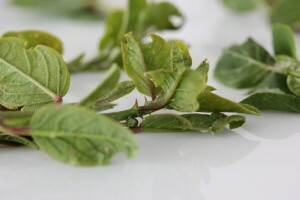 When you find the plant, you need to pick the top part of the stems so that they are each about 10 to 15 cm long. Those with big leaves, uneaten by insects, are best. Watch out as caper plants have thorns! So you have to make sure not to get pricked. Also, there is only about a 2 month window when you can pick these baby caper stems, i.e. between April and May, because after this the plant will become too big. 2. After you gather the caper stems, you need to remove the thorns from the same. There is no other way to do this, but to sit down and go through each stem individually and cut off the thorns with a knife or with your fingers. Also throw out any leaves which have worm holes in the same. 3. 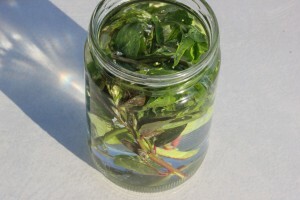 Next, you need to place the caper stems in a bottle or bucket filled with enough water to cover all of the caper stems. If the caper stems are in a bucket, you can place a lid with a rock over top the lid to make sure the caper stems are submersed. Personally, I don’t like to have buckets filled with fermenting stuff in my kitchen, so prefer the bottle method. Place the bottle in a dark place for 4 days. On the 4th day, the water will have turned a muddy yellow-green colour. Empty the water from the bottle. It will smell. 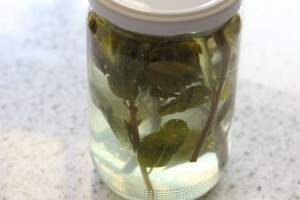 Then refill the bottle with enough water to cover all of the caper stems. Let sit for another 3 to 4 days, until the caper stems become dark green in colour and the water yellow again. 4. Drain the caper stems in a sieve. Rinse the caper stems well with water. 5. Next, cover the caper stems with salt and let sit for about ten minutes. How much salt? Well, this is a rough rule of thumb that I observed. It is very difficult asking my aunt for precise measurements. But this is what I observed: 1 heaped teaspoon salt for about every 7 caper stems. 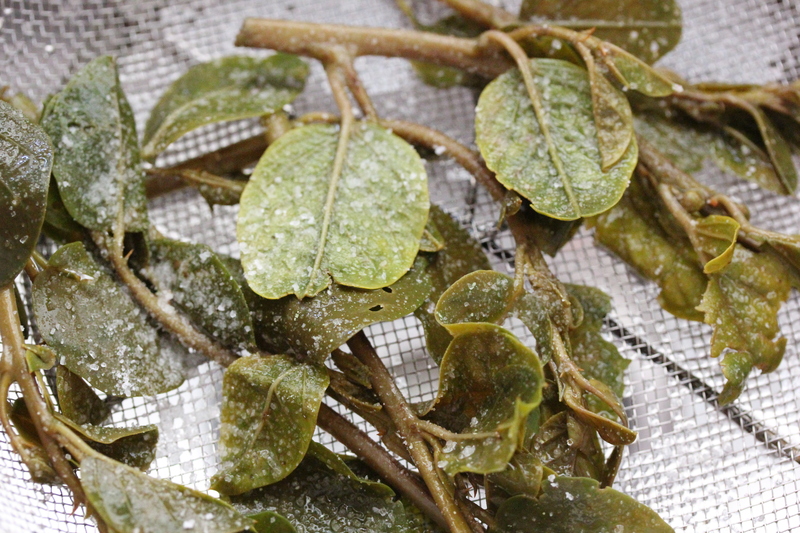 Basically, each caper stem should have a generous sprinkling of salt on it like in the photo here. 6. Place the caper stems in a bottle and fill with red wine vinegar until the caper stems are covered. Place in a dark cupboard where the “kapari” should last for up to a year. Don’t worry if little white spots start to appear on the “kappari”, this is part of the fermentation process. When serving, drizzle a little olive oil over the same to reduce the sharpness of the vinegar. 7. Serve “kapari” as a side dish with most meals. I particularly enjoy it on lentils, with salad, and most meats.